The condo is fully furnished and equipped for cooking. The condo has two bedrooms and two bathrooms, full kitchen, living room, laundry room, patio, and is 1500 square feet. The condo is finished to a high standard with granite counters in the kitchens and bathrooms, tile floors, GE stainless steel appliances, solid wood cabinetry, and recessed lighting throughout the apartment. In the Master bedroom there is a King size bed and master bathroom with walk in shower. The guest bedroom has a Queen size bed and guest bathroom with shower and tub. The living room and bedrooms have full size sliding glass doors that open up to the patio and lush landscaping. During the day the apartment is showered with natural sunlight, it feels like your living in the garden. 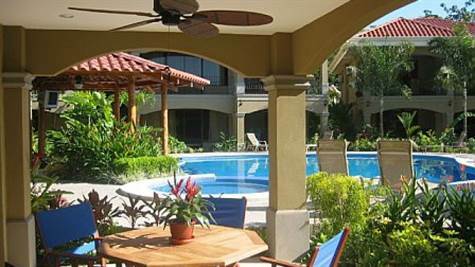 Amenities here include free wireless internet, 24 hour manned security in gated complex, cable TV, air conditioning, in house washer and dryer, and concierge desk to arrange all tours and transportation.